Photo courtesy of Jason Clark and the Evansville Courier and Press. Following a huge win over Wichita State, the Illinois State Redbirds did not lose focus at their next task at hand and took down Evansville by the score of 70-60. EVANSVILLE, INDIANA---On January 15, 2016, the seniors of the Evansville Purple Aces, D.J. Balentine, Egidijus Mockevicius, and Adam Wing, won their first contest inside Redbird Arena in Normal, Illinois. 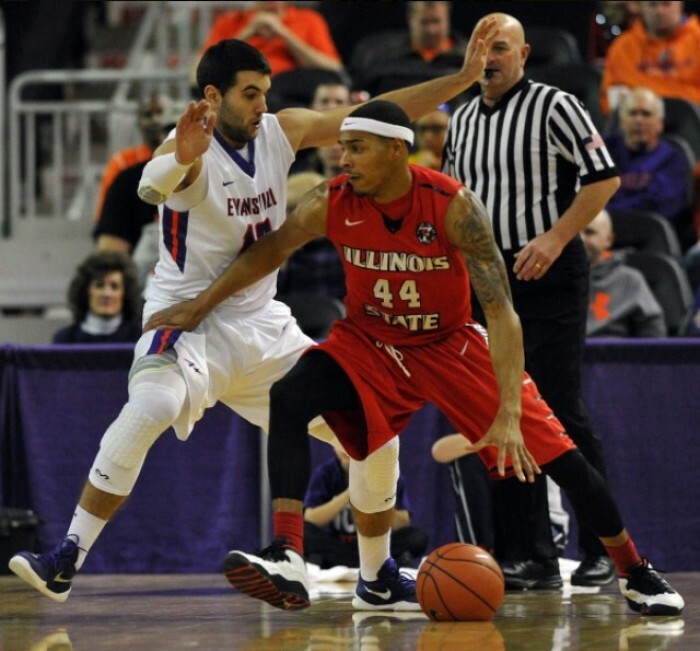 Tonight, the Illinois State "revenge-seeking" Redbirds avenged their home defeat. Despite trailing 30-29 heading into halftime, Dan Muller's Illinois State squad was a different team in the second half, especially on defense, resulting in a 70-60 win. Ignited with a made triple from Blake Simmons, Evansville sprinted out to a quick 8-3 lead heading into the first media timeout. However, the Purple Aces' leading by such a margin was a very swift sight as DeVaughn Akoon-Purcell carried a 6-0 spurt to give Illinois State their first lead. Back and forth action ensued inside the Ford Center, for Evansville's Egidijus Mockevicius supplied a small edge by blowing the roof off the arena with two monster dunks before the Redbirds recovered with five consecutive, capped off by a Tony Wills trey (14-12 ILST). Later in the half, Illinois State "jazzy junior" Paris Lee upped his team's advantage to a half-high four with a jumper at the 8:27 mark (19-15 ILST). But, a 6-3 spurt in the final minutes, pushed Evansville in front by one walking into the intermission. Tickling the twine from outside twice to start the second twenty minutes, Illinois State flew ahead to a three-point advantage less than 100 seconds in. Moreover, the Redbirds' MiKyle McIntosh emerged as his old self--he was one for eight from the field in the first half--with back-to-back made jump shots, which further widened the gap between the two (39-33 ILST). Although the Missouri Valley Conference's leading scorer D.J. Balentine (19 points) did everything he could with personal stretches to keep the Purple Aces within striking distance, Dan Muller's team would almost immediately recover. Therefore, Marty Simmons' Evansville group found themselves trailing 11 with 8:38 remaining. Yet they could do nothing about it. Because of the Redbirds matching nearly ever point down the stretch (all but one to be exact), the Purple Aces were unable to get any closer than six. Illinois State was automatic from the charity stripe in the final four minutes as they were a perfect 12-of-12 (15-of-16 for the game). Second place was solely in the talons of the Redbirds. Normally responsible for about five points a game, no one expected Illinois State's Nick Banyard to have a high-scoring game. Too dramatic? No! Not really! Banyard, who had a career-high of 11 points prior to tonight, was phenomenal on Thursday as he was hitting from everywhere. The 6'8" transfer from New Mexico ended his evening perfect from beyond the arc (2-of-2) while being a burden in the paint with six made attempts out of nine. Complementing his 18 points, he also grabbed four rebounds against the nation's leading rebounder Egidijus Mockevicius. While Paris Lee was bringing the ball up the court for the final possession of the first half, it looked as though "stud sophomore" MiKyle McIntosh was going to be held scoreless through the first twenty minutes. Then, the 6'7" forward swished a triple just before the half's end. That one shot changed his night. With the confidence booster, McIntosh came out of the intermission with two more made attempts while killing momentum for Evansville on multiple occasions. He finished with a very solid performance of 11 points and 8 rebounds, which is the third time in his last six he has posted 10 plus points and 6 plus rebounds. 2014-2015 MVC Newcomer of the Year DeVaughn Akoon Purcell chipped in 14 points while speedster Paris Lee stuffed the stat-sheet with 12 points, 4 rebounds, and a career-high 9 assists. 15-11 (9-4) Illinois State will seek to turn their three-game winning streak to four when hosting Bradley on Saturday. VAVEL USA will bring post-game coverage from Redbird Arena. Known for their home dominance, the Evansville Purple Aces had an average winning margin of 18.5 and a undefeated 11-0 record inside the Ford Center. Then, Wichita State walked in, and pounded them like the big brother they are. Now, Illinois State dominated them. The Purple Aces have now lost three of their last four contests (UNI) and are sliding down the slopes at the wrong time. These are the games that decide what seed a team gets at Arch Madness! The best two teams in the conference have downed Evansville on their home court. Will Southern Illinois? We will find out in less than two weeks. What about Northern Iowa? That is the last bout prior to each team's "March to the Arch." So could the Purple Aces end up in the 4/5 game like last year? Sadly, yes. And if they do, that means Wichita State will loom in the semi-finals, which will answer the big question of whether this is Evansville's year one day earlier. "Just got to win. Definitely the main thing. You definitely got to win." ---D.J. Balentine on his team's upcoming schedule. 19-7 (8-5) Evansville will travel up north to Chicago for a Sunday afternoon battle with Loyola (IL). VAVEL USA will supply post-game coverage. One would think, with the Purple Aces' rebounding machine Egidijus Mockevicius, Evansville would easily win the rebounding battle. He or she thought wrong! Holding "Iggy" to 10 rebounds (and 16 points), four less than his nation leading average, the Redbirds won the rebounding battle 39-35 and ultimately the game. Interestingly enough, Illinois State was also victorious on the boards in the first meeting (44-35), but failed to exit with the W. Nonetheless, it's time fans get the following thought drilled into their head: Illinois State is a GREAT rebounding basketball team! "That is one of our keys. That's what makes us who we are. That's what makes us excel." ---Nick Banyard on his team's rebounding prowess. Obviously with the top two teams not named Wichita State facing off for second place with just five games left until conference tournament time, tonight's Illinois State/Evansville showdown had great implications in the molding of seeds for Arch Madness. First off, the Redbirds hold the second spot and have taken away a tiebreaker grasp of the Purple Aces on them. Furthermore, they will be holding a full game lead on Southern Illinois and Evansville heading into next week (assuming Bradley doesn't shock the world). Second, the battle for third will leave either Evansville or Southern Illinois in a semi-final contest with the Shockers. For any team (besides the Redbirds because of their success in knocking Wichita State off in St. Louis) the best case scenario is to face the powerhouse on Sunday in the championship. However, with the emergence of the Redbirds as a conference front-runner, the fate will be sealed for one of the two previously mentioned. Finally, how crazy will this year's Missouri Valley Conference men's basketball tournament be? It may be the best ever! The Northern Iowa Panthers are playing their best basketball prior to a matchup in Wichita on Saturday. Dequon Miller's Missouri State Bears is a very intriguing bunch. And the Loyola (IL) Ramblers are always dangerous. The point is, anything could happen come March 3-6 in St. Louis! Could a two seed be surprised by a seven? Absolutely! Though, the later one plays Wichita State the better. VAVEL USA will supply full coverage from the Scottrade Center for this year's Arch Madness. "Yeah because Tony Wells--he is an excellent defender--he was giving Balentine problems. And of course DeVaughn (Akoon-Purcell) is our captain and leader and he was on the bench, so once he came back in the game it gave us a lot of confidence." ---Illinois State's Paris Lee on whether his team "felt good" heading into halftime down one. "It feels good. I've been waiting on it but it all came together in a game. I didn't even realize I had it." ---Illinois State's Nick Banyard on his career-high point performance. "We know when 'Big E' (Egidijus Mockevicius) gets it down there he is going to be going up with it. So, whenever they get it down in the post, we have to make sure to contest as much as we can and don't give them many free layups." ---Nick Banyard on defending the paint from not just Egidijus Mockevicius but Evansville's guards as well. "That's real big for us as a team. Now we know what we are capable of." ---Nick Banyard on knocking off Evansville on the road after taking down Wichita State at home. "He is playing great basketball. As we have talked about lately and to his credit, he has just continued to work on getting extra shots up. He has been shooting it better in practice lately. I thought he would start making some. But, his activity level, of course, is always. He finishes around the rim. He was great." ---Illinois State Redbirds' head coach Dan Muller on Nick Banyard's development and emergence as a contributor. "We just have to keep getting better. Our zone (defense) is getting better. Our man defense has really come along. Our rebounding has been terrific. We have ball carrier issues at times. We have some guys that get frustrated still. But honestly, if we keep on practicing the right way and getting better on all the little things, I think we will be fine." ---Dan Muller on what his team needs to do moving forward. "When you have two or three possessions that you probably should have scored, and you didn't come up with a bucket, it does have an effect on you. We just have to do better of finishing at the rim. All of us." ---Evansville's D.J. Balentine on his team's offensive struggles. "They all hurt the same. Our guys put their heart and soul into it. Anytime you don't get the result you want, it hurts." ---Evansville Purple Aces' head coach Marty Simmons on whether tonight's loss with second place on the line "hurt" more than past losses.